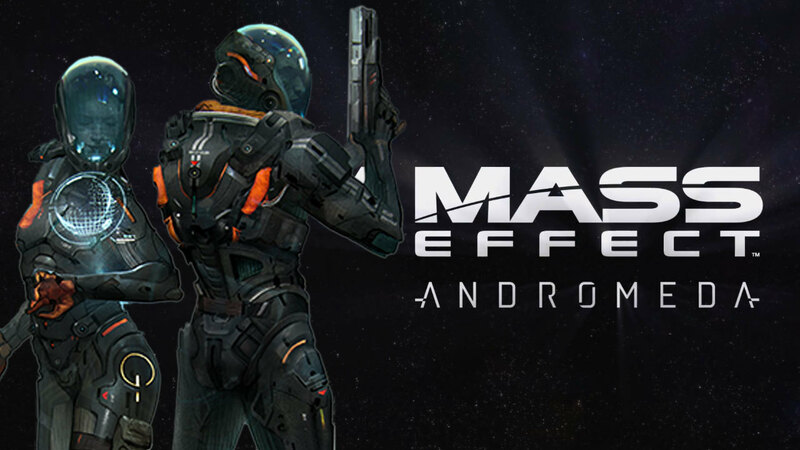 LAN Mob Game Review - Mass Effect Andromeda - Guest Post by "Dictator"
After 5 years of waiting, Mass Effect: Andromeda has finally arrived. As a huge BioWare fan, and a Mass Effect enthusiast in general, I still could not help but be a little apprehensive. 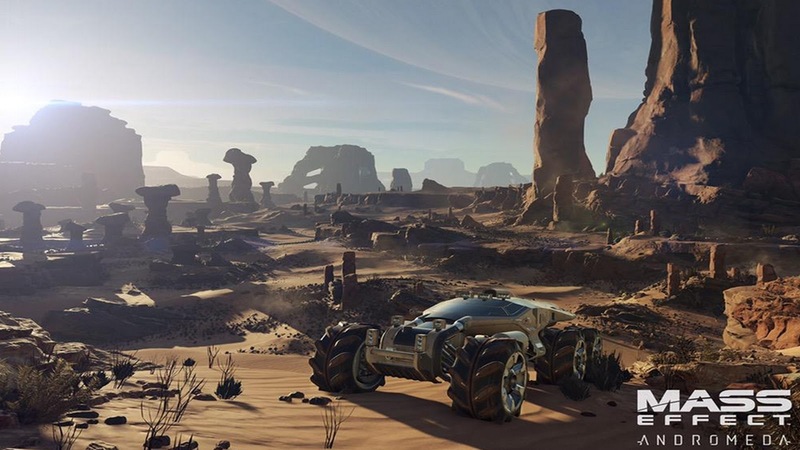 Leaving behind the familiar characters and planets, returning to the more open world format of Mass Effect 1 and bringing back a player-controlled vehicle were all bold choices. Add in a development phase that was filled with employees leaving or getting shuffled around, the Mass Effect 3 ending debacle and the convoluted and overwrought trudge that was Dragon Age: Inquisition, and I was personally a bit worried about how Andromeda was going to turn out. The plot of ME:A is that in 2185, around the same time as the beginning of Mass Effect 2, the privately-funded, multi-species civilian organization known as the Andromeda Initiative kicks off their 600 year journey to the Heleus cluster of the Andromeda Galaxy. 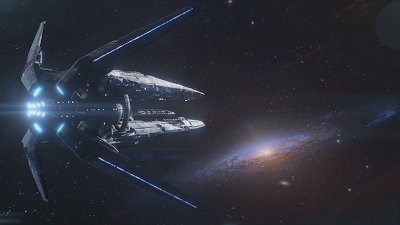 Consisting of 4 Arks containing 20,000 members of the 4 major Milky Way races (asari, turians, salarians and humans) and the Nexus, a massive space station set to be the new center of civilization and containing a mix of the four Council races and some krogan thrown in for security, their goal is to find a new home for Milky Way races. Largely consisting of scientists, the plan is to explore the cluster, which has been found to contain a number of habitable planets, and create settlements, gather resources and study the cluster. Leading each race, except for the krogan, is a Pathfinder, typically an elite soldier, who is the spearhead for exploration, survival and diplomacy. After their 600 year journey, the settlers aboard the human ark are awoken from cryo-stasis to find that things have not exactly gone to plan. The Hyperion is lost and adrift amidst an unknown destructive interstellar phenomenon that becomes known as the Scourge and cannot reach the Nexus or the other 3 Arks. Habitat 7, what was to become humanity’s new homeworld, has been decimated by the Scourge and rendered uninhabitable. A plan to make a quick recon of Habitat 7 results in contact with a hostile new alien species known as the kett, the discovery of a race of small artificial constructs called the Remnant that maintain large ancient structures with the ability to terraform, and the death of the human Pathfinder, Alec Ryder. This results in you taking the role of the Pathfinder. After making contact with the Nexus you learn that things have not fared any better there, with the Nexus being heavily damaged by the Scourge as well, and most of the Initiative leadership being killed, as well as numerous other worlds being rendered not viable, and attacks from the kett. There was also several floundered attempts at establishing outposts and a rebellion by disillusioned Initiative members that ended with them being exiled after the rebellion was put down by the krogans, and then the krogans left after getting shorted by the new Initiative leader. It all adds up to a monumental task for the human Pathfinder, the only known Pathfinder at this time, because the Nexus cannot contact the other three Arks either. Your goal is to find the other Arks, restore viability to the surveyed worlds, establish outposts on viable worlds and find a way to deal with the kett. The new protagonist, whichever one of the Ryder twins that you pick, had big boots to fill when following in the footsteps of Commander Shepard. And, in my opinion, they succeeded in not just matching Shepard as a likable character but exceeded them. I chose to play as Sara Ryder for my first playthrough, so from here on out I will refer to Ryder as such. Sara was only in the military for a short time before joining the Initiative, resulting in her being less professional and buttoned-down than Shepard. She is a bit more open with her emotions, as well as tending to be sarcastic and humorous and sometimes profane. It makes her much more unpredictable and a lot of fun, as you are never quite sure what she is going to do. Still, she takes her role seriously and tries to fulfill the role she was unexpectedly thrust into by the death of her father, Alec Ryder, himself a former N7 and a brilliant AI scientist. A Pathfinder needs a team to help them in their role, and BioWare also knocked it out of the park with the writing in this department as well. Right from the beginning, you have Cora Harper by your side. A wildly powerful human biotic who trained with asari huntresses, she has a warm friendly attitude, although she is very professional and by the books. 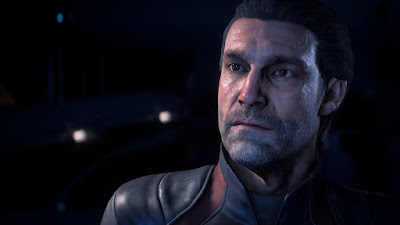 Despite originally being Alec Ryder’s second-in-command and slated to be his successor, Alec instead makes his child the new Pathfinder instead. Although understandably upset about it at first, Cora never holds it against Sara and serves her in every capacity she is able to. Also serving alongside Ryder is Liam Kosta, a former police officer and first responder; he is enthusiastic and energetic and believes in both Ryder and the Initiative as a whole. His energy often gets him in trouble and causes friction with other teammates, but his intentions are usually well-placed. As you explore a number of other personalities join the team. Bringing the muscle is Nakmor Drack, a grizzled 1400 year old krogan who came to the Heleus cluster after having seen all that the Milky Way had to offer. Having seen what his people had gone through back in the Milky Way, he is vested in seeing their resurgence in Andromed. He is an interesting mix of bitter disillusioned cynic and reassuring grandfather to the team and gets on well with most all of the team, offering them advice. Then there is Pellessaria B’Sayle, more commonly known as Peebee, a brilliant asari academic and who is wildly independent and unpredictable. She joined the Initiative because she was bored with the Milky Way and wanted to tread where no one else has. She quickly establishes herself as the authority on Remnant technology, making her a useful member of the Pathfinder team, even if her irreverent attitude and impulsive nature cause problems. The turian teammate Vetra Nyx is a confident, capable smuggler, gunner and requisitions specialist. She’s smart, cunning and humorous and knows her way around the less savory settlements of the Heleus cluster, making her invaluable when operating in areas where Ryder’s Pathfinder status holds less sway. She’s also deeply caring, having brought her younger sister with her and being her guardian, as well as looking out for the people caught in the Exile/Nexus politics. And finally, there is Jaal Ama Darav, a member of the native angaran race and a member of the angaran Resistance that has been waging war against the kett for decades. 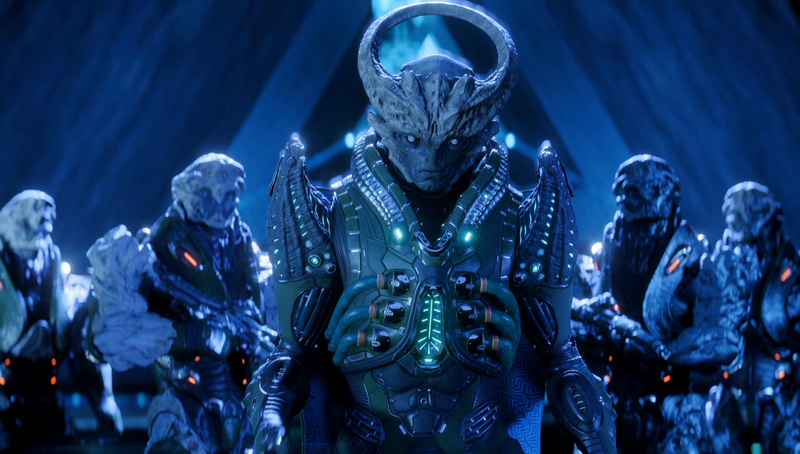 While the angaran are leery of any aliens due to their experience with the kett, Jaal choses to believe in Ryder and joins their ship to serve as liaison and learn more of the Initiative species. A capable fighter, he, like all angaran, is also an open and honest person, while also being immensely curious. Him and Ryder quickly become friends and he trusts her with helping his people fight back against the kett. There is also the support aspect of Ryder’s team, who are equally interesting. They include salarian pilot Kallo Jath, the human science officer Suvi Anwar, human engineer Gil Brody, and asari medical officer Lexi T’Perro. And finally there is SAM, a powerful AI designed by your father, who helps manage the entire Initiative, as well as assisting Ryder via an implant. The biggest opposition to the Initiative is the leader of the kett faction in the Heleus cluster, simply known as the Archon. Despite an imposing physical appearance and a menacing voice, the Archon is a very lackluster and poorly-written character. Whereas previous Mass Effect antagonists have been nuanced characters who are not out-and-out villains, the Archon is very straightforward evil. He wants to conquer the entire cluster and believes that Remnant technology is the key. He captures and tortures other species frequently and throws insults about Ryder’s insignificance around frequently. It’s exactly as tiresome as it sounds. Compared to Saren Arterius from Mass Effect 1, who believed his actions were saving organics from the Reapers, or The Illusive Man from ME2 and ME3, who had good intentions but extreme methods, the Archon appears very one-dimensional and lacking in depth. He also rarely appears during the games approximate 80 hours of play, and usually just to hurl insults and threats at Ryder. Sadly, what could have been an interesting character was tragically wasted. 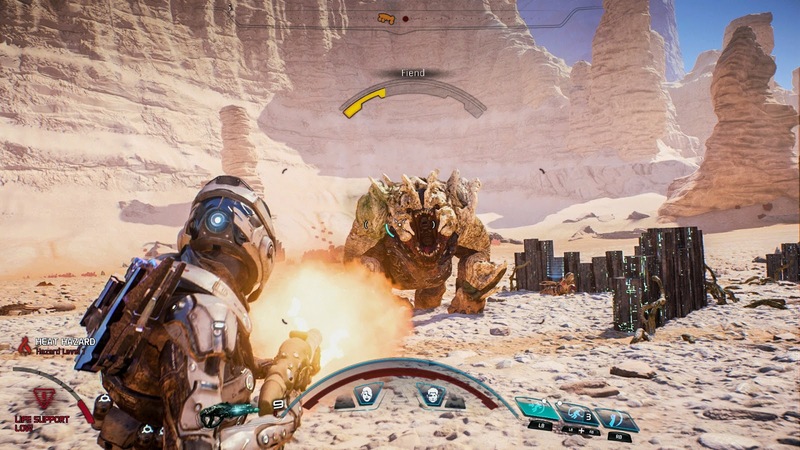 In addition to new characters and setting, BioWare also shook up the combat system. Previous entries were much more focused on the cover mechanic, resulting in your character just taking potshots from behind a crate. 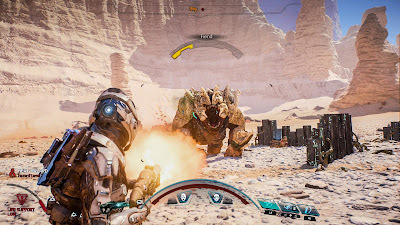 The addition of a jetpack and a boost dash converted combat into a much more mobile, fluid experience, resulting in Ryder and friends zipping around the battlefield while lobbing abilities left and right. This also ties into the new Favorites system. In previous entries, you had to lock into a single class at the beginning of the game and were stuck with that class and set of abilities throughout. Now, thanks to your Pathfinder implant and SAM’s control, you have full access to all the abilities to level up and can change class (now called Profiles) pretty much on the fly, with each profile lending passive bonuses to such things as specific weapon damage, melee damage or combat, tech or biotic damage and cooldown. By combining 3 abilities and a Profile you can create up to 4 favorites and set them up to maximize a certain fighting style or be able to set off combos. It’s a good system, but it doesn’t quite work as shown. When your father is demonstrating the system in the first mission, he is swapping profiles rapidly and firing abilities off left and right. But when Sara gets the same capability uploaded into her implant, the ability to swap Favorites is buried in menus, requiring you to pause and navigate a few layers and select a Favorite and then wait as all of the abilities go on cooldown. Another strange decision was to take away any sort of control over your teammates and when they use their abilities. This means that to pull of combos, you either have to hope that they just hit the exact same enemy that your are targeting with the ability that will detonate a combo, use your ability after theirs to detonate the combo or just use your own abilities to prime and detonate combos. If the combat and characters is where ME:A excels, it's the story where it falls apart. First off, it suffers from very poor pacing. After the heart-pounding first mission it slows things down to establish the background of what has happened, which is understandable. But then it instead makes you slog through exploring 3 separate planets, one of which is an barren irradiated desert and another a barren frozen tundra, doing a repetitive slog of finding 3 Remnant monoliths and activating the Remnant vault to fix the environment. Things pick up significantly during a daring raid on a kett facility, but then it falls back into exploring 2 more planets although one of the planets, Kadara, at least is more interesting than the others, due to the fact that it has mountains and lakes and great vistas and a sub-plot of two different factions of Initiative exiles struggling to control the settlement. It starts to come together at the end as the tension ratchets up and you do a number of story missions in a row, with minimal exploring, but by then the game is practically over. All the exploring wouldn't be so bad if the worlds weren't so barren and lifeless. After all, there are 2 desert planets, 1 arctic planet and an asteroid surface that is essentially a gray desert. That tends to get a little monotonous, as does the fact that they never really change. Despite the Remnant terraforming vaults doing stuff like raising the temperature on Voeld, or clearing the radiation from the air on Eos, or making the water less toxic on Kadara, you never see any actual change on the worlds. The scenery and geography never differs, you don't see more people out exploring or more and more settlements popping up. The only reason you know the worlds have changed is because you don't have to listen to SAM repeatedly alerting you to every environmental hazard any more. The boring, unchanging environments would maybe be forgivable if it wasn't for that fact that they are also lacking any really meaningful content. There are a few sidequests, called Tasks, here and there that pose some moral dilemmas and raise some interesting questions, but the majority do not. They all turn into “go here and talk to this person, travel here, talk to this person, hold Y to scan, go back to original personal and talk to them”. They are just filler to pad the length of the game and justify it being an open world/sandbox game. They don't even give any good loot for rewards, just experience and planet viability points, the latter of which become irrelevant after you get a planet to 100% viability anyways. The main story missions and companion missions go back to the old ME2/ME3 formula of crafted mission-specific areas with big set-piece moments and beautiful cutscenes and well-written dialogue and important decisions to make. And this is where the game excels. It feels like the old games, it feels right and it makes you wonder why they got away from that format. If you want the best ME:A experience, just play the main story missions and companion quests and skip all of the Tasks that you can. Seriously. I'm not kidding. Interestingly, you can tell that this game likely was originally not meant to be an open world format, but a more linear format, as you can get “out of sequence” for events. 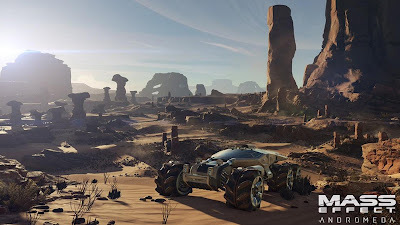 For example, while driving around on Eos, Ryder would occasionally remark that we had just gone by the Remnant monolith that Peebee had mentioned, despite the fact that I had yet to meet Peebee and had not heard the term Remnant yet either. Or I received messages aboard the Tempest regarding Jaal, despite not having met Jaal, or his entire species, yet. A number of other things in the game also hint at either a rushed or troubled development, or major last minute changes. For example, the mission where Ryder finds the derelict turian Ark starts off like it might be a major encounter, but instead just turns into a brief walk through the damaged ship without any combat. Similarly, Ryder and friends make a big deal of the Remnant star ship crashed on Elaaden, but you only take a brief stroll through it on a mission, and then it is never utilized again. Or the fact that the game suffers from a number of technical glitches, even more than typical for a BioWare game. Some of them were often humorous, like the time that I walked into the Tempest's galley and for some reason there was 2 Dracks standing there. Others were more irritating, like when running around settlements and outpost, the framerates would frequently drop or stutter. And others still were absolutely infuriating, like when Tasks would not complete out, or cutscenes that wouldn't trigger thereby preventing further progress, or numerous hard freezes that required hard resetting the console. So, after a long wait, we experience the stumbling first steps in a new direction. Am I talking about the plot of ME:A, or the game itself? I’ll let you decide. While the characters, voice acting, graphics and combat are some of the best ever in a Bioware game, the story line is weak and poorly paced and the game suffers from the new open world format. While I was playing the game, I did enjoy it, but afterwards the more that I thought on it, the more issues I found. All in all, it adds up to a lot of missed potential and possibly the weakest entry into the Mass Effect series. Hopefully, BioWare will take some lessons away from ME:A for the DLC and future entries.